The building which later became The Shakespeare is depicted on the 1838 map (182). According to the article below, published in 1982, John Lewis André was the tenant between the years 1845-8, he died in 1848 and is buried in the churchyard. It is believed that the building became a pub to cater for railway navvies shortly before 1878, when the railway line was opened. 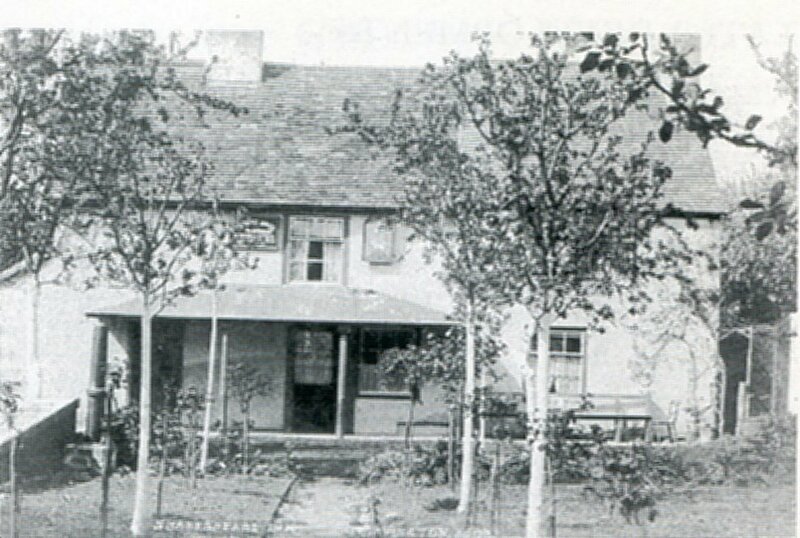 According to the 1881 Census, 'The Shakespeare Inn' was occupied by Thomas Mansell, Innkeeper and Carpenter. In the 1871 Census Thomas Mansell is described as a wheelright, home not specified. Thomas Mansell died in 1898 and left the running of the Shakespeare to his wife Ann and to his daughter Sarah Ann Amos, the wife of Thomas Amos. More detail of the Mansell family is to be found in the Churchyard section. Here is a copy of the article and poem passed to me by Jenny Grey of Shakespeare Lane. It was originally published by the Evesham Admag 10/12/1982, with co-operation from Evesham Almonry museum, who hold photos dating from early the 20th century. Certain fact conflict with my own. The Old Shakespeare Inn was opened in the early 1890s by a Mr Amos, who operated it as an outdoor bar. Because it had a lovely garden, families, local labourers and itinerant pickers enjoyed visiting the ‘Shake’. It had a license to sell beer and cider, and did not provide any other alcoholic drinks. It was taken over by Raymond Walker in 1912, and he lived there with his wife and two sons. By this time, the pub was part of the Flowers Brewery chain. In 1916, the pub was taken over by Alice and Herbert Walker (no relation). They stayed for a number of years, with their son George and his wife Christina taking over the tenancy when Herbert and Alice retired. George and Christina had four children – Fred, Anne, Kathleen and Christina. By this time there was an indoor bar and smoke room, plus a kitchen and three bedrooms. Fred remembered that it was a very popular pub, being the headquarters of the village football team (supreme champions in the Stratford League one year! ), the Harvington and District Darts League and the home of the local branch of the British Legion. Clive Dunn of Dad's Army fame visited the pub on a number of occasions while his wife Priscilla was acting in Stratford. He took part in the darts matches that took place but wasn't very good. Gerry Millard remembers him as very sociable and would buy rounds for the locals. When George Walker died in 1964, Fred ran it for a while, but the brewery opted to close it despite a public outcry. Local villagers signed a petition to keep it open, but to no avail. Much of the original building was demolished when it became a private home, although the renovation did retain as much as possible (some walls, part of a chimney, the cellar and one or two beams). One feature of ‘The Shake’ was a large porch supported by four ornamental pillars. These have been retained and form an interesting feature in the garden. One other story associated with the Old Shakespeare relates to a former tenant of the building, a Mr John Lewis André, who arrived in Harvington in 1845, and stayed at the house. He died in 1848 and was buried in the churchyard. He was reputed to be the younger brother of Major Lewis André, who was hanged in 1778 as an alleged spy in the American War of Independence, although it was later shown that Benedict Arnold was the spy and Major André was simply the messenger between him and the British forces. For what may be, there’s none can tell. Our hearty thanks are paying. Perhaps may know no better. A single word or letter. Pea picking for a living. Their time to it were giving. To guard us at our labours. But don’t create a riot. You sit and smoke at leisure. You’ll find it quite a pleasure. And signs his name – G Owen. On the last day of the Shakespeare villagers remember a large gathering when free drinks were offered. Frederick (Freddie) Norman L (Fred), born 1908. An electrician, died fairly young. Maureen C, born 1947. Living in the USA. Patricia, born 1949. Living near Malvern. Sharon, born 1951. Lived Great Comberton. Carol A, born 1952, living (2017) Ross on Wye. Ann, adopted in the WW2, she married a Hawlins and they lived in the Shakespeare after it had ceased to be a pub. She divorced and moved to Oxford. Mr Hawlins later marred June and they still (2017) at The Shakespeare.